(WACO, Texas)—Retail food prices showed a slight increase during the third quarter, with a basket of 16 staple items at the grocery store totaling $46.75, according to the latest Texas Farm Bureau (TFB) Grocery Price Watch survey. Third quarter prices rang in at 73 cents higher than last quarter and 97 cents more compared to this time last year. Although it’s an increase from quarter-to-quarter, the cost of groceries in Texas is still relatively economical. Several items at the meat counter saw an increase. Sirloin steak saw the largest increase, up 10.05 percent, to $6.57 per pound. Beef demand was high during the summer grilling months, and consumers proved to be willing to pay more for a quality steak. Pork chops were up 28 cents, nearly 8 percent, over last quarter, but still lower when compared with the third quarter prices from 2016. The price of boneless chicken breasts rose 4 cents, or 1.28 percent, over last quarter. Lean ground beef, however, dropped 12 cents, or 3.08 percent, from last quarter. Sliced turkey saw a decrease of 20 cents, or 4.08 percent. “These prices reflect increased turkey production for the summer, when the number of turkeys grew and feed costs were lower,” Boening said. Fresh produce was a mixed bag in the third quarter. Lettuce dropped 4.39 percent, or 5 cents, to $1.09 per head, while fresh tomatoes increased 4.31 percent, or 5 cents, per pound to $1.21. Grapefruit saw a larger jump of 6.06 percent, or 6 cents, to $1.05 per pound. The full impact of Hurricane Harvey on Texas agriculture is still unclear, but Boening noted the most heavily affected crop was cotton. Of the 16 food staples surveyed, items that increased included white bread, dried pinto beans, rice, vanilla cake mix, 2% milk and block cheddar cheese. Vanilla ice cream dropped to $6.32 per half gallon, and corn flakes rang in at the same price—$3.28. 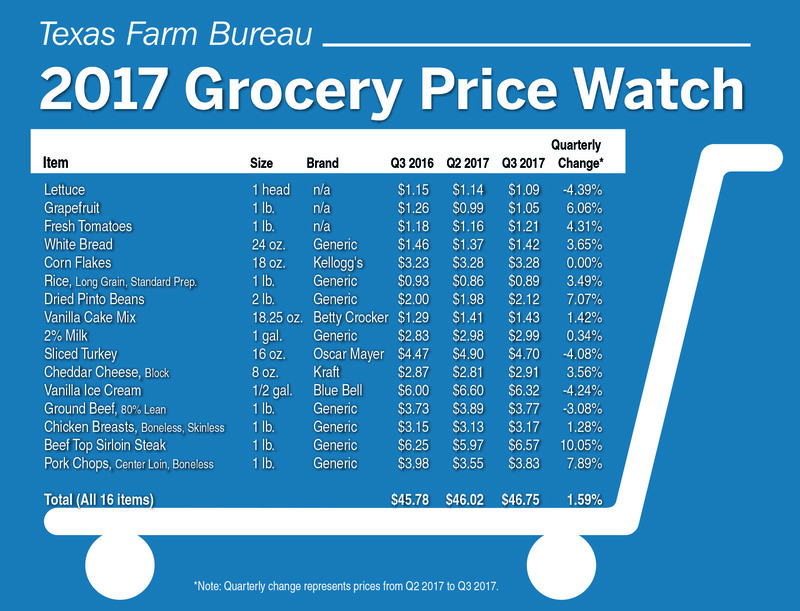 The TFB Grocery Price Watch is conducted quarterly by shoppers located across the state of Texas. The current survey data was collected by 45 shoppers from Sept. 7-14, 2017. TFB has monitored Texas food prices through its Grocery Price Watch survey since March 2009.